The following books are amazing additions to your early concepts library! Each book introduces readers to shapes and letters by inviting them to explore diverse tastes and sights around the world. DESCRIPTION OF THE BOOK: In this delicious forest, the bears are made of rectangular brownies, the goldfinches are triangles of lemon tart, and the butterflies are oval jelly beans. What child could resist learning shapes from such delectable creatures as these? Collage artist Juana Medina has outdone herself with this array of tooth-achingly sweet animal desserts that come in all shapes and sizes. MY TWO CENTS: This book takes the reader on a short and sweet (literally), path in the forest. It introduces different animals and compares their shape to decadent treats. A diverse group of animals include goldfinches and chipmunks, and sweets include baklava and carmelita. The mixed medium is interesting in this children’s book, and the use of photography in illustrating the sweets gives you an immediate sweet craving! There are also a variety of shapes that extend beyond your typical shapes like the parallelogram, oval, and crescent. This book is a great fit for your early childhood readers who like sweets and animals. It introduces shapes in a different, yet playful manner, and it draws your eye to the positioning of treats and the animals’ silhouettes. The short and sweet text allows the reader to focus on the concepts of shapes. At the end of the book, the author shares a recipe for chocolate covered strawberries, because why not?! Overall, a great addition to your early concept collection of shape books. TEACHING TIPS: This concept book pairs well with a five senses unit since you can use the bakery treats as realia after you read the book to your future bakers and chefs. There are other concept books in this series by Juana Medina that reinforce counting and ABCs. ABOUT THE AUTHOR-ILLUSTRATOR: Juana Medina may have over-indulged her sweet tooth doing the research for this book! Fortunately, her young twin sons keep her active at their home in Washington, D.C. A native of Colombia, Juana is the author-illustrator of 1 Big Salad, ABC Pasta, and the Pura Belpré winner Juana and Lucas. Please visit her and her work at www.juanamedina.com. DESCRIPTION OF THE BOOK: Discover twenty-six types of vessels, from the more common–canoe and motorboat–to the unusual–umiak and Q-boat. Just like in Alphabet Trucks and Alphabet Trains, colorful art includes the letters of the alphabet hidden (and not-so-hidden) in supporting roles in the illustrations. The text features familiar as well as unusual boats from around the world, packing in tons of instant kid appeal, and upper and lowercase letters are integrated into the action of the art rather than solely in the typography. Back matter includes age-appropriate facts about each featured boat. MY TWO CENTS: Come on a rhyming ride through the alphabet on a boat! This is no ordinary trip as you will be immersed in a rich vocabulary of boat life around the world. There are various types of boats and they have various ways of moving through the water. For example, you have the barge, the gondola, and the umiak. The illustrations are crisp and detailed, which allow the reader to search for letters within the background. A must read in the classroom for all future sailors! This book exceeded my expectations of an ABC book, especially in the use of technical vocabulary of boats and more. I definitely learned a lot about boats and their functional parts. While certain parts may become complex for readers who are not into boats, the text includes short phrases so that readers get small doses and remain engaged in the alphabet. A glossary is included in the back to expand on each boat’s description and use. Overall, this book is a great addition, as it invites readers to a new, and maybe familiar, world especially if they live near a body of water. TEACHING TIPS: In addition to adding this book to your collection of ABC books, one can incorporate this in their phonemic awareness and writing lessons. After each letter introduction, there is a rhyming scheme that is great for phonemic awareness mini-lessons on rhyming and/or phonics lessons around word families. Readers can also go on a letter hunt as the illustrator has placed various letters across the pages. In writing, teachers can focus on using descriptive words that go beyond describing objects using color and size, like describing boats by their speed or the way they move in the water. Videos of each boat and their function are a wonderful supplement to this read aloud and lessons, as it will bring the boats to life. Easily paired with the rest of the author and illustrator’s books around the alphabet! DESCRIPTION OF THE BOOK: Telegrams to Heaven / Telegramas al Cielo recounts the moving childhood of Archbishop Óscar Arnulfo Romero y Galdámez, who from an early age discovers the candor, light and power of the word, which he uses to pray and to write poetry, sending telegrams to heaven from his heart. René Colato Laínez, the renowned Salvadoran writer, has written a touching story about the great Salvadoran prophet who dreamed from his childhood of being a priest, and became not only a priest, but also a bishop, an archbishop, and the great orator of his country. His word remains, for the Salvadoran people and the world—a prayer, a poem, a sweet telegram that Archbishop Romero continues to send in the name of his people to the heart of heaven. The colorful, modern illustrations of Pixote Hunt make us reflect with deep tenderness, showing us the innocence of the great Archbishop Romero as a young child. MY TWO CENTS: René Colato Laínez offers a bilingual picture book tribute to the Archbishop Oscar Arnulfo Romero, chronicling the icon’s early spiritual development. The Archbishop, then simply known as Oscar, grew up in Ciudad Barrios, in the San Miguel department of El Salvador. Laínez introduces us to Oscar as he works in his family’s home post office and telegram business. Oscar marvels at the telegraph, which can, “like magic” send messages across long distances. He then begins to wonder if he can also use this technology to communicate with heaven. His father clarifies that messages can be sent to God through prayer, prompting Oscar’s dedication to praying “when he woke up, when he milked the cow, after he finished his homework and to give thanks before every meal.” Oscar’s devotion permeates all aspects of his life. Even his artistic talents, like playing the flute and writing poetry and music, serve as expressions of his spirituality and commitment to God. The story’s sole source of tension arises when Oscar expresses his desire to become a priest. His father is chagrined, and instead sends his son to work at a carpentry shop as a distraction. The text, however, does not specify why Oscar’s parents were not supportive of his wish to become a priest. His father’s admonition, “there are so many things that you can be in this life,” coupled with details in the text about businesses owned by the Romeros and their ability to hire a private teacher for Oscar, hint at a socioeconomic reason. Laínez may have highlighted the moment to demonstrate Oscar’s staunch and early commitment to the Church, but I wanted more clarity. Indeed, Oscar is not dissuaded from entering the priesthood. When Bishop Dueñas visits Ciudad Barrios, Oscar uses his carpentry shop earnings to buy a crisp white suit to meet the prelate. This encounter is a watershed moment in Oscar’s life, and thus ends the narrative chronicling his childhood. On the following page, we see Oscar as an adolescent, headed to youth seminary in San Miguel and, as the text indicates, later on to Rome, at the behest of Bishop Dueñas, to complete his studies. The final spread is of Oscar, now ordained as Father Arnulfo Romero, palms facing up in front of the church altar, ready to celebrate mass in front of the Ciudad Barrios community, where his journey began. The accompanying illustrations by Pixote Hunt mainly mirror the information conveyed in the text, but the images lack the warmth of Laínez’s tone. The digital, abstract style leaves characters appearing flat and expressionless, and fail to depict settings distinctly. Many of the spreads are set against surreal or monochromatic backgrounds, such as the telegram and carpentry shops, which appear almost indistinguishable because of the identical color choices. In the few scenes in which a setting is clear, such as the central plaza or the town’s church, details are limited to straight lines, and the people of the community appear as outlined shapes in a solid color with indistinguishable facial features. Although the story is about The Archbishop, who came to be loved and respected across the world, he will be forever identified with El Salvador. The abstract visual elements used in the illustrations instead create a distance between the subject and his surroundings, an overall disappointing effect. Laínez’s admiration and respect for the Archbishop is evident and deeply personal, as he relates in the Author’s Note. No doubt Salvadorans and other Latinxs familiar with the Archbishop will be touched and pleased to see his story in print, particularly for young audiences. This title also serves as a reminder of the hope that lives within the Salvadoran community despite many current and past hardships. However, for audiences completely unfamiliar with the Archbishop, or those looking for a comprehensive biography, the story’s narrow focus and static illustrations will fall short. I was left with many additional questions about Oscar’s childhood, his hometown, and his family. Perhaps other readers will, like me, be encouraged to seek more information elsewhere. I do, however, reserve the hope that this will be the first of many titles for young readers that will chronicle that Archbishop’s life and legacy. 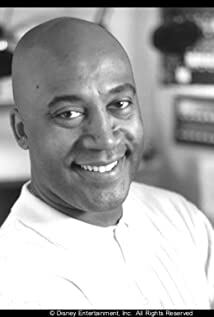 ABOUT THE AUTHOR: Known as “the teacher full of stories,” René Colato Laínez is the Salvadoran author of several bilingual picture books including I Am René, the Boy/Soy René, el niño (Piñata Books), Waiting for Papá/Esperando a papá (Piñata Books), Playing Lotería/ El juego de la lotería (Luna Rising). I Am René, the Boy received the Latino Book Award for “Best Bilingual Children’s Book.” Playing Lotería was named a “Best Children’s Book” by Críticas magazine and the New Mexico Book Award “Best Children’s Book.” Playing Lotería and I Am René have both been nominated for the Tejas Star Book Award—the K-6 bilingual counterpart to the Texas Bluebonnet Award. ABOUT THE ILLUSTRATOR (From his website): As a director, art director and designer in the film industry I bring more than 10 years experience in animation to every project. Highly skilled in drawing, painting and musical composition, my creative goal is to bring an innovative insight to every project. Always on the cutting edge, my experience in combining animation with live action began in 1994 when I directed and art directed THE PAGEMASTER, and continued as I designed the 3D opening and interstitials for FANTASIA 2000 that seamlessly weaved the animated sequences together. I feel my unique achievements in film and music have garnered me the honors of being a voting member of both the Academy of Motion Picture Arts and Sciences and the GRAMMYs/Recording Academy. 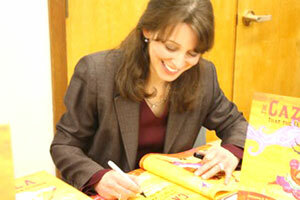 ABOUT THE REVIEWER: Jessica Agudelo is a Children’s Librarian at the New York Public Library. She has served on NYPL’s selection committee for its annual Best Books for Kids list, and is currently a co-chair for the 2018 list. She contributes reviews of English and Spanish language books for School Library Journal and is a proud member of the Association of Library Services to Children and REFORMA (the National Association to Promote Library and Information Services to Latinos and Spanish Speakers). Jessica is Colombian-American and was born and raised in Queens, NY. From his website: In a previous chapter of my life, I was a Sets Technical Director at Pixar Animation Studios. For nine years, I collaborated with some of the most talented artists and storytellers in the world to help realize the environments in films, such as, Up, Cars 2, The Good Dinosaur, Inside Out, and Coco, as well as several of Pixar’s short films, including The Blue Umbrella. Now, I am taking the skills and experiences from my time working in the film industry and putting them to use as an author and illustrator of children’s books. My debut picture book, The Greatest Adventure, will be released Fall 2018 through Arthur A. Levine Books an Imprint of Scholastic Inc.
Now, here’s a brief description of The Greatest Adventure: Eliot imagines sailing wild rivers and discovering giant beasts, right there on his block. But he wishes his adventures were real. Eliot’s grandpa, El Capitán, once steered his own ship through dangerous seas, to far-off lands. But he can’t do that anymore. Can Eliot and El Capitán discover a real adventure… together? Come find out All aboard The Greatest Adventure. Now….here is the beautiful cover of the book, which releases September 11, 2018. Q. What picture books do you remember from when you were growing up? Are there any stories or artists that were especially meaningful or inspirational for you? A. In a bright red building I affectionately remember as the “Red Library,” I discovered a book called Album of Sharks, illustrated by Rod Ruth and written by Tom McGowen. This book left such a vivid impression on my mind due to Ruth’s striking full page illustrations, that over 20 years later, when I tried to locate a copy of the book with absolutely no information other than my childhood memories, I was able to do so because I remembered each and every one of Ruth’s illustrations so clearly. I find it funny how at such young age we are intrinsically drawn to certain subjects, and for whatever reason I was then, and still am, drawn to sharks. I love the danger, mystery, and wonder they conjure in my mind, and Ruth’s illustrations captured this in a way that no photo has ever been able to do. Later I learned that Rod Ruth and Tom McGowen paired up on over a half dozen “Album of” books, each beautifully illustrated, and I imagine, entertainingly written—I wasn’t such a good reader back in those early days. As an homage to Album of Sharks and more specifically as a small, but deeply felt thank you to Rod Ruth, I inserted a token of admiration for one of Ruth’s most memorable paintings in my debut picture book, The Greatest Adventure. Q. What are your favorite art materials to work with? How much (if any) of your process is digital? A. Just give me a pencil and some white computer paper, and I will be distracted working for hours. These have been my default materials since the beginning. I dabble with gouache, acrylics, and oils, but they are not my natural mediums. If I need to do some thinking or planning there’s nothing better than pencil and paper. I followed that same practice on The Greatest Adventure. Throughout the planning and dummy stage of this book I solved compositions and decided on scene staging with these simple materials and time. All the heavy lifting happens at this humble stage. When I’m finally satisfied with a composition and ready to do a final illustration, I scan in the sketches and begin the meticulous process of painting them digitally in Photoshop. My final paintings are 95% digital with subtle touches of texture scanned in from traditional media. Q. You’ve come to picture books from animation (congratulations on Coco’s many wins!). How is the artistic process for the two kinds of storytelling similar or different? Are there any secrets about Coco (or Pixar in general) you can share with us? A. Thank you for the congratulations. Coco represents the final year and a half of my career at Pixar, and I’m very proud of the film, and the work I helped bring to the screen, namely the cemetery in Miguel’s hometown of Santa Cecilia. Fundamentally, the process of creating a picture book and an animated film are very similar in that both mediums require a team of individuals to bring to life a story and world that had never existed before. Where they differ most strikingly is in the number of individuals per team and their level of specialization. Picture book-making, though clearly a team effort, does not require an army of individuals at the creative stage. Much of the work is realized by the author and illustrator in collaboration with the editor, designer and production team. And so, in general terms, the publishing team is smaller and the skillset of each individual on that team fairly broad when compared to the specialization required in producing a computer-generated film. A typical Pixar film employs 250-300 highly-specialized people to collaborate on a singular vision. Just to give you an idea of how specialized the work on these films is, there are specialists known as “groomers,” whose sole responsibility is to create hair, and trust me this is a full-time job, especially, when you’re trying something as innovative as the wild, red locks of Merida in Pixar’s Brave, or you’re styling the hair for an entire town as was required in Coco. Imagine the equivalent in the picture book world, an illustrator who only draws hair! My area of expertise is called Set Dressing. It is not too different from interior decoration. Think of how interior decorators bring rooms and homes to life with their choices of color and arrangement of decor. There is, however, one key difference: the set dresser’s goal in arranging objects on a film is to reveal aspects of the characters through their environment, which requires a great deal of story specificity. Think of a college dorm room versus the bedroom of someone who is obsessively organized. How would these rooms be arranged differently? What would each room say about its owner’s character? The answers to these questions are provided by set dressing. My work on Coco required the careful arrangement of flowers, candles, and foods on the graves which made up the cemetery in the film. These ofrendas were arranged to show the love and respect family members paid to their deceased relatives on Día de los Muertos. It took me nearly a year and a half to set dress the entire cemetery, and this is but one part of the process required to bring to screen one scene in the film. Q. What are some books you’re looking forward to from Latinx creators? These can be picture books or chapter books. I have admired the work of Julia Sardá for many years. Her work is primarily known in Europe, but I think that she is one of the most talented children’s book illustrators out there today. Somebody please bring her to the American children’s book market! I’m also excited to see what comes next from Lorena Alvarez, a Colombian children’s book author and illustrator, whose exciting work I came across last year with the release of Night Lights published by Flying Eye Books. I also just discovered JOAN PROCTOR, DRAGON DOCTOR: The Woman Who Loved Reptiles written by Patricia Valdez and illustrated by Felicita Sala. The book was recently released and it speaks to me both through Felicita’s beautiful illustrations and the subject’s love of lizards, which I can completely relate to. I can’t wait to get my hands on it! Q. What do you want your next great adventure to be? Is there anywhere you want to travel to or wonders you’d like to see? At the beginning of last year, I wondered the same thing: what would be my next adventure? I had just left Pixar to pursue a full-time career in children’s books, and one of my goals outside of finishing up my first book was to find ways to travel the world as an independent artist. For the longest time, I had admired how my best friend’s sister had managed to see so much of Europe and South America with the help of playwright grants. So naturally, I figured somebody for some reason must need an author/illustrator to go to the rainforest! I then stumbled upon an artist-in-residence program called Voices of the Wilderness. This residency sponsored by the U.S. Forest Service brings artists of all sorts to remote areas of Alaskan wilderness to witness their beauty and share the importance of conserving these wild corners with the American public. I applied for the residency and a few months later found myself standing in the rain on Admiralty Island, a 1,500 square mile rock covered in a swath of temperate rainforest and home to the greatest concentration of coastal brown bears in the world. This was not the adventure I had envisioned; it was grander. And this island and one bear in particular on it have become the centerpiece of my next story for children. Where next? Who knows! Cecilia Cackley is a performing artist and children’s bookseller based in Washington, DC, where she creates puppet theater for adults and teaches playwriting and creative drama to children. Her bilingual children’s plays have been produced by GALA Hispanic Theatre and her interests in bilingual education, literacy, and immigrant advocacy all tend to find their way into her theatrical work. You can find more of her work at www.witsendpuppets.com. DESCRIPTION OF THE BOOK: Together, a boy and his parents drive to the city of Havana, Cuba, in their old family car. Along the way, they experience the sights and sounds of the streets–neighbors talking, musicians performing, and beautiful, colorful cars putt-putting and bumpety-bumping along. In the end, though, it’s their old car, Cara Cara, that the boy loves best. MY TWO CENTS: I really enjoyed the trip this picture book takes through the Cuban countryside and into the city of Havana. It is easy to identify with the narrator, as he gets squashed in the backseat by all the passengers! Engle makes the question of whether or not the narrator and his father can get the car to work a suspenseful one, but as the journey gets underway, we don’t feel pity for the family for having an old car, but rather excitement for everything they see along the road to Havana. 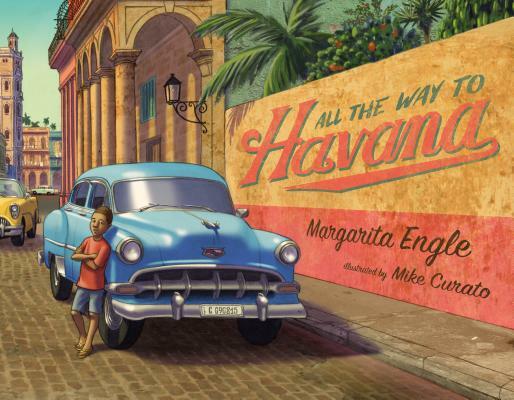 The bright colors of the cars alongside the blue of the sky and ocean make the pictures very attractive and illustrator Mike Curato adds plenty of detail to the vehicles and the scenery in Havana. The figures in the pictures can sometimes look a little flat, but it was nice to see an Afro-Latinx family featured—an unfortunate rarity in a lot of picture books. Both the author and illustrator include notes at the end talking a little about the background of the story and the process of researching the illustrations. TEACHING TIPS: As might be expected, this is a perfect story time book, especially for kids around ages 2-4 who are usually VERY into cars, trucks, and trains (so much that many bookstores have a separate section just for those books). The sounds the car makes invite call and response with story time or classroom listeners. The way the narrator talks about how Cara-Cara looks compared to all of the other cars might be a good lead in to having students draw their own imaginary car, including what it would look like and what sounds it would make. The context of traveling to a family celebration is also a good discussion point, where children can talk about their own trips to visit relatives and various family celebrations. WHERE TO GET IT: To find All the Way to Havana, check your local public library, your local bookstore, or IndieBound. Also, check out Goodreads, Amazon, and Barnes & Noble. 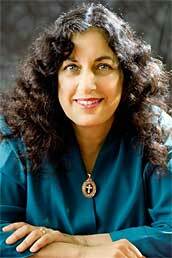 ABOUT THE AUTHOR: Margarita Engle is the national Young People’s Poet Laureate, and the first Latino to receive that honor. She is the Cuban-American author of many verse novels, including The Surrender Tree, a Newbery Honor winner, and The Lightning Dreamer, a PEN USA Award winner. Her verse memoir, Enchanted Air, received the Pura Belpré Award, Golden Kite Award, Walter Dean Myers Honor, and Lee Bennett Hopkins Poetry Award, among others. Drum Dream Girl received the Charlotte Zolotow Award for best picture book text. Her newest verse novel about the island is Forest World, and her newest picture books are All the Way to Havana, and Miguel’s Brave Knight, Young Cervantes and His Dream of Don Quixote. Books forthcoming in 2018 include The Flying Girl, How Aída de Acosta learned to Soar, and Jazz Owls, a Novel of the Zoot Suit Riots. Margarita was born in Los Angeles, but developed a deep attachment to her mother’s homeland during childhood summers with relatives. She was trained as an agronomist and botanist as well as a poet and novelist. She lives in central California with her husband. ABOUT THE ILLUSTRATOR: Mike Curato loves drawing and writing almost as much as he loves cupcakes and ice cream (and that’s a LOT!). He is the author and illustrator of everyone’s favorite polka-dotted elephant, Little Elliot. His debut title, Little Elliot, Big City (Henry Holt Books for Young Readers, Macmillan), released in 2014 to critical acclaim, has won several awards, and is being translated into over ten languages. There are now four books in the Little Elliot series: Little Elliot, Big City; Little Elliot, Big Family; Little Elliot, Big Fun; and the latest addition, Little Elliot, Fall Friends. Meanwhile, Mike had the pleasure of illustrating Worm Loves Worm by J.J. Austrian, All the Way to Havana by Margarita Engle, and contributed to What’s Your Favorite Color? by Eric Carle and Friends. He is working on several other projects, including What If… by Samantha Berger and his first graphic novel. Publishers Weekly named Mike a “Fall 2014 Flying Start.” In the same year he won the Society of Illustrators Original Art Show Founder’s Award. ABOUT THE REVIEWER: Cecilia Cackley is a performing artist and children’s bookseller based in Washington, DC, where she creates puppet theater for adults and teaches playwriting and creative drama to children. Her bilingual children’s plays have been produced by GALA Hispanic Theatre and her interests in bilingual education, literacy, and immigrant advocacy all tend to find their way into her theatrical work. You can find more of her work at www.witsendpuppets.com.